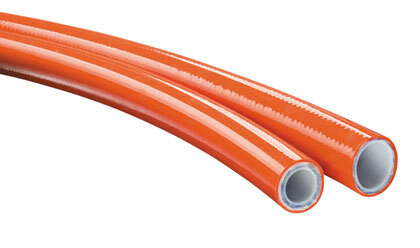 This twin line diving hose is made using a Piranhaflex™ 1" Return Line; non-conductive orange covered hydraulic hose joined together with a 3/4" Supply Line; non-conductive orange covered hydraulic hose, available in long continuous lengths on wooden reels. For use in commercial diving; operating sub-sea hydraulic tools. Click here for more info.